The posters in this gallery show the magnificence of fish swimming in formation. 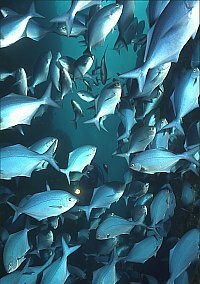 Abundance is associated with paradise and fish schools make one feel like being there. 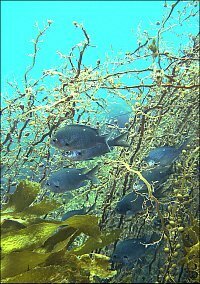 f006124: A peer-group of young giant boarfish found hang-gliding in the rising current at 20m depth in the Goat Island marine reserve, New Zealand. 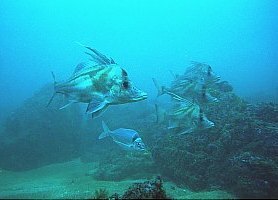 Giant boarfish (Paristiopterus labiosus) live over the continental shelf and can grow to 1m. When young, they form small peer groups but adult males and females pair up for life. The odd-ball out is a young Tarakihi (Nemadactylus macropterus), who, having a similar black mark and long fins, has mistakenly identified itself as one of them. f021026: A school of large jack mackerels found resting in the shelter of Goat Island, New Zealand. 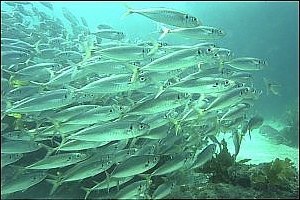 Jack mackerels (Trachurus declivus) are schooling fish, living in the open sea and near the shore. They swim fast and are hunted by many predators. f012015: A school of blue maomao descends from the surface to observe the photographer. Poor Knights Is New Zealand. Blue maomao (Scorpis violaceus) are often seen in dense schools, foaming the surface where they feed on small planktonic shrimps. f000623: A school of blue maomao is waiting patiently for the tide to turn in the Goat Island marine reserve. Blue maomao (Scorpis violaceus) feed on planktonic animals in the swift currents around promontories. f009809: Demoiselles sheltering in a cluster of featherweeds in Nursery Cove, Poor Knights Is, New Zealand. These two-spot demoiselles (Chromis dispilus) are hunted by many predators, but they are safe inside these tough seaweeds. 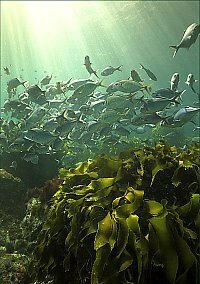 f023304: A mixed school of young blue maomao and trevally is resting above a yellow-green strapweed in Nursery Cove, Poor Knights Is. 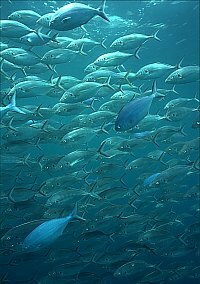 When food abounds, fish find time for resting or playing and they collectively decide what to do. f023737: A group of young trevally takes a rest to digest their early morning breakfast of pelagic shrimp. Nursery Cove, Poor Knights Is, New Zealand. 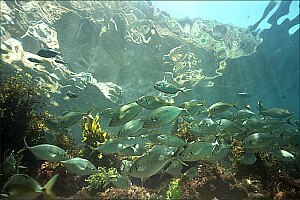 These young trevally (Caranx georgianus) may not be aware of the splendour of their environment but they instinctively seek nice places to rest, like here, with the cliff face above. f024134: Like excited school children, these blue maomao jostle for a better place to view the strange divers. Curious as they are, blue maomao (Scorpis violaceus) always find time to interrupt their business for a closer look. 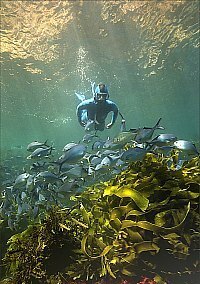 f023314: A snorkeldiver descends slowly to meet a school of young blue maomao in Nursery Cove, Poor Knights Is, New Zealand. Not quite as blue as adults, these young blue maomao were found resting above the waving fronds of a Lessonia strap weed. 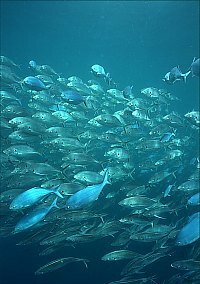 f024634: A school of fast moving trevally interrupts its feeding frenzy to look at the photographer. Poor Knights Is, New Zealand. 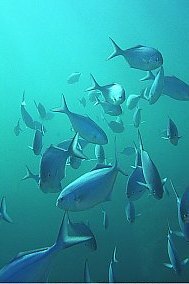 These young trevally (Caranx georgianus) can be seen foaming the surface while frantically feeding on planktonic shrimp. f024633: A school of fast moving trevally mixing with less motivated blue maomao, Poor Knights Is, New Zealand. 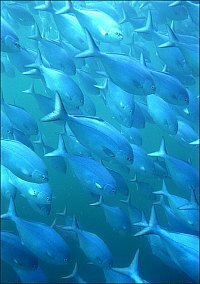 Trevally eat similar zoo plankton as blue maomao but they need more of it.